Yesterday, former president George H.W. Bush passed away, leaving behind an enormous legacy in politics and American culture as well as a smaller, lesser-known legacy as a lover of fashion statements. If you didn't know, Bush became known as quite the stylish president for his love of wearing bold, colorful socks. "I'm a self-proclaimed sock man," Bush once said in an email from the Republican National Committee. "The louder, the brighter, the crazier the pattern - the better." Former Presidents George H.W. Bush and George Bush attend a funeral service for Barbara Bush in Houston, Texas. 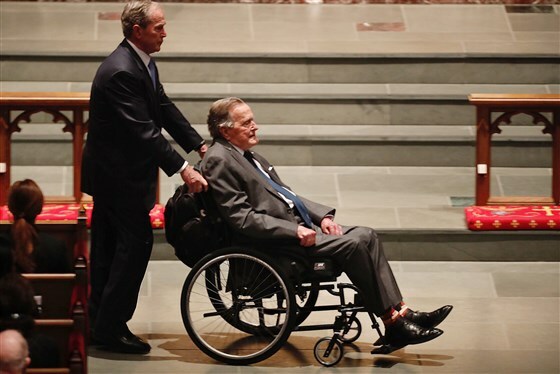 In 2007, Bush was diagnosed with a form of Parkinson's disease, which affected his ability to walk. 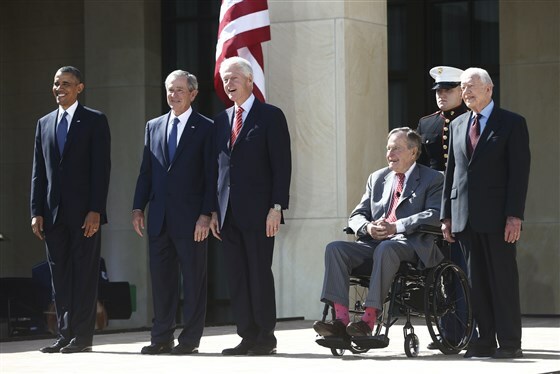 Having to rely on a wheelchair, the former president's ankles were always visible, hence the colorful socks. In her book My Father, The President, Bush's daughter Doro Bush Koch shared that her father used fashion as a way to express his positive outlook on life. "Brandishing colorful socks is simply his way of making the best of his mobility situation and still finding joy in life," she wrote. 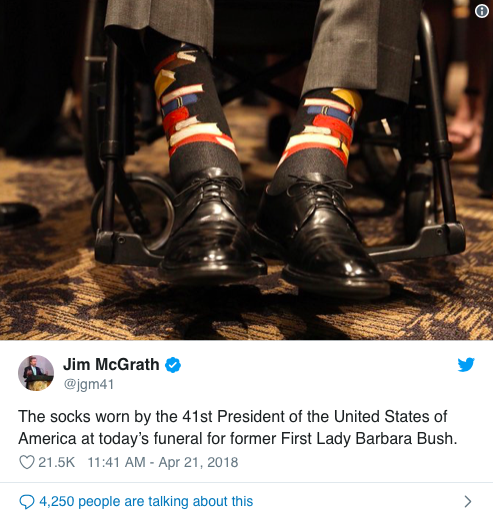 At his late wife's funeral, Bush honored First Lady Barbara Bush by wearing socks with books on them, commemorating his wife's dedication to expanding literacy in the U.S.
From socks with his face on them, dog socks or Texas-themed pairs, George H.W. Bush was a man who knew how to have fun with fashion and never take life too seriously. Even in the most formal settings, Bush was never one to shy away from a pop of color, which allowed him to bring a little bit of fun with him everywhere he went. Bush's ability to make a fashion statement is just one very small trait on his list of many for which he will be remembered and revered.